22 July (2018) – What's New on Netflix Canada Today! After devastating terror attacks in Norway, a young survivor, grieving families and the country rally for justice and healing. Based on a true story. In Norway on 22 July 2011, right-wing terrorist Anders Behring Breivik murdered 77 young people attending a Labour Party Youth Camp on Utøya Island outside of Oslo. A three-part story. About the survivors of the attacks, the political leadership of Norway, and the lawyers involved. A three-part story of Norway’s worst terrorist attack in which over seventy people were killed. 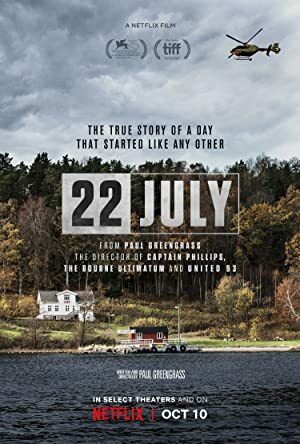 22 July looks at the disaster itself, the survivors, Norway’s political system and the lawyers who worked on this horrific case.